I've sampled assorted and sundry white teas before. I remember liking most of them, but nothing really stood up head and shoulders above the pack. But just recently I found myself really impressed with Snow Buds, from Rishi Tea. This is an excellent white tea, or at least so say I, but I think part of the fact that I liked it so much had to do with my tea drinking habits lately. Which has pretty much consisted of a whole lot of strong, heavy black teas - Yunnans and Assams mostly. To suddenly make a changeover to a delicate white tea was a nice switch and served to remind me that black is not the be all and end all of tea. 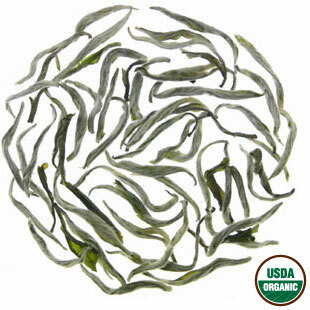 Rishi describes Snow Buds as "a rare white tea that is hand harvested in very limited quantities for Rishi on the high mountain peaks of northern Fujian, China." As for the flavor, there's no point in me reinventing the wheel, when Rishi has already offered up a good description, "its clear infusion offers a fresh green note with a complex savory flavor and aroma that can be likened to toasted grains and baked sweet potato." I don't know that I'd have been clever enough to isolate the two latter components of the flavor, but I also won't argue with that description. If you're looking for a nice, light white tea, whether as an antidote to too much black or just because, you could do a lot worse than Snow Buds. To beginners, white tea may feel like it contains no taste at all. But when you drink lots of tea, you will see the light and subtle flavor. So drink lots of white tea, gradually you will realize the difference between this tea( what I often called pure tea) and water. Really enjoy your post, especially the ones on tea quotations.